Note: Check the PCB picture. 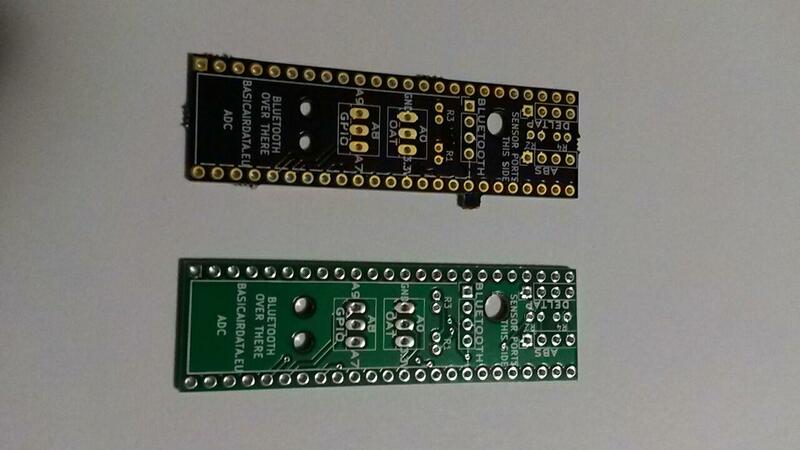 We’ve sent the protoboard to two different online services. 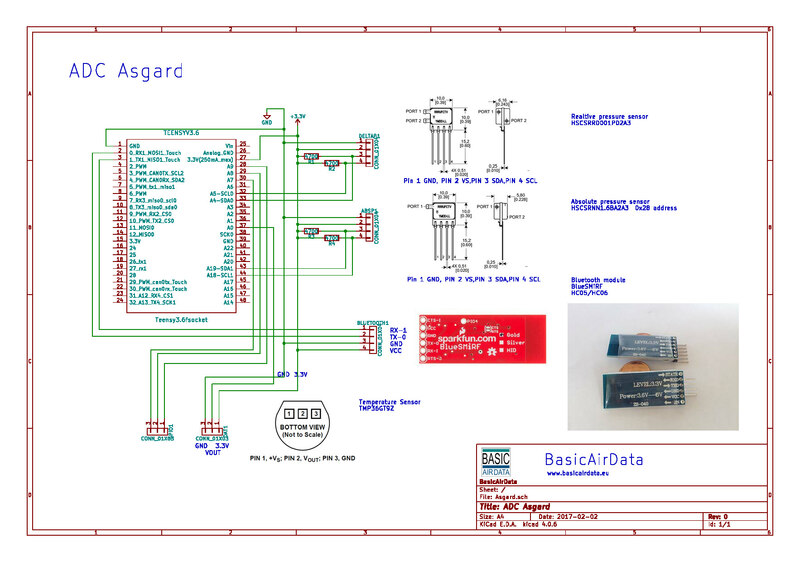 DirtyPCB(Green) and OSHPark(Purple).For OSHPark we have a direct link to the board. So far no critical issues. 2x SIL Socket, 4 contacts, Pitch 2.54 (You can solder directly the sensors to the board or use straight sockets strip also). You can buy one connector with multiple contacts (i.e. 32) and split it by hand to the desired size. See for example this online shop. 1x Socket strip, straight, 4 contacts, Pitch 2.54. You can buy one connector with multiple contacts and trim to size with a cutting tool. See for example this online shop. 2x Socket strip, straight, 24 contacts, Pitch 2.54. 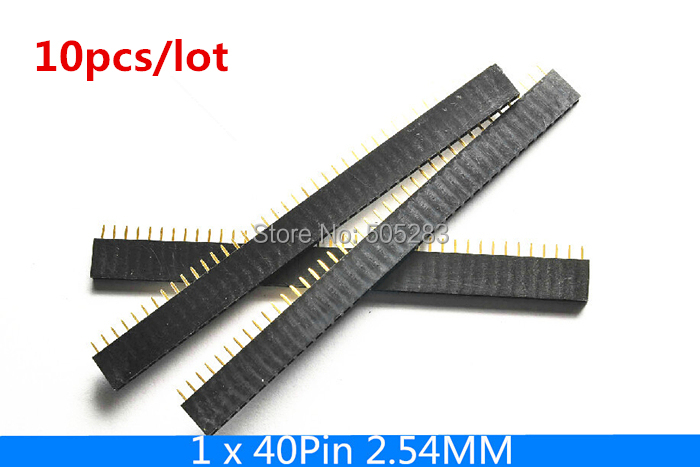 You can buy one connector with multiple contacts and trim to size with a cutting tool. See for example this online shop. 4x Through hole ceramic Resistor R= 4700 Ohm, L=3.6 (DIN0204). (Similar size is good, mounting is vertical). See for example this online shop. 1x Servo extension cable, 15 cm. See for example this online shop. 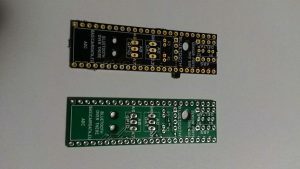 1x Teensy 3.6 board with header pins. See for example this online shop. 20 cm(for use within the enclosure) Silicone tube , , wall 0.75mm. Shore 60°. See for example this online shop. 1x Bluetooth module HC-05. It is possible to use also HC-06 or BlueSmirf modules. Most modules have connections pins parallel to the board. Prior to mounting the pins need to be rotated with a plier to be at 90° with respect to the board. If you find a module supplied with the correct pins orientation please contact us. 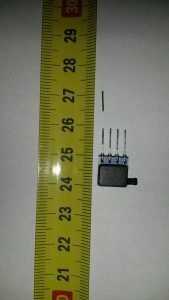 1x TMP36GT9z Temperature sensor. See for example this online shop.